What should I do if my printer displays a cartridge error message? 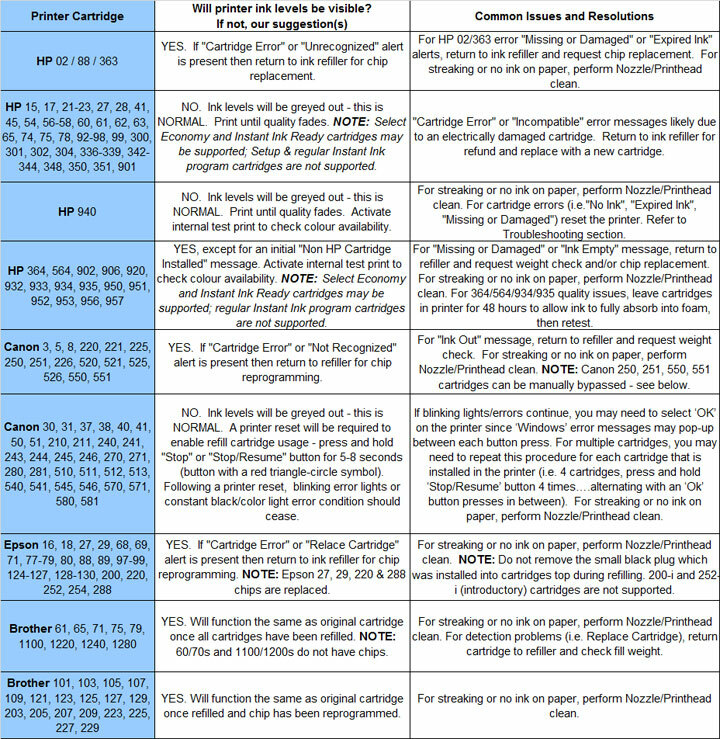 For refilled HP 934/935, HP 950/951 or HP 970/971 ink cartridge series printer models which display printer/cartridge error messages such as “missing or damaged”, “replace”, “empty”, etc., there is a new printer firmware update available for your printer model which will enable refilled ink cartridges to function normally. What should I do if my printer displays a ‘low ink’ or ‘counterfeit’ cartridge error message? Some printers have trouble recognizing refilled cartridges. You should be aware that there are generally 3 types of ink cartridge alerts messages and certain ‘ink low’/’depleted’/’counterfeit’ messages are completely normal. NOTE: “Empty” and “Low Ink” alerts are COMPLETELY NORMAL for HP 21, 22, 56-58, 60, 61, 62, 63, 64, 65, 74, 75, 92-98, 301, 302, 303, 304, 339-348, 350, 351, 901, 940 ink cartridges which have been refilled! While at first this may be considered an unusual workflow, it does allow printing to continue. Though not necessary, HP 15/17/21/22/23/27/28/41/45/56/57/58/78 ink levels can be reset by following the procedures located under ‘Troubleshooting‘. Generally you can ignore low ink indicator messages until you actually see the print quality begin to degrade. For cartridge error messages, try cleaning the cartridge’s copper area, and the back of the printer’s cartridge insertion slots, i.e. where the copper printed circuits exist. See cleaning instructions on the printer manufacturers website; some of which suggest cleaning the connections with a damp coffee filter. Next power cycle the printer by turning it off and on. 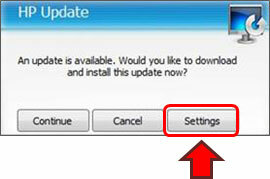 A hard reset may also be needed; turn the printer off, unplug it, wait several seconds, plug it back in and turn it on. How can I save on ink/printing costs or lower my consumption of ink? 1) Refill your ink cartridges/tanks so they can be used over and over….save good cartridges from going into our landfills! 2) Avoid the Arial font. It uses more ink than Times New Roman and many other fonts. 3) Print in draft mode or on both sides of the paper (if printer duplexing is available). 4) Minimize the use of color ink by printing text in grayscale or use ‘black only’ mode. 5) If your have an individual ink tank printer (i.e. 4, 5 and 6 ink cartridge printer models), it is suggested by HP & Canon to leave the printer on at night (most will go into sleep mode within an hour), this will avoid the much heavier printhead ink priming and maintenance routines which are typically initiated when the printer is powered on and off. 6) Refilled ink cartridges typically provide consumers with 10-20% more ink, on average, vs. brand new ink cartridges from the manufacturer. The additional ink will help offset ink consumption losses due to unavoidable automatic printer ink maintenance found in many of the newer HP, Canon and Epson printer models. The replaceable or semi-permanent PRINTHEAD (or PRINTHEADs for HP 88 & 940 ink-series printer models) will eventually fail over time with usage and age. Click here for more information. CAUTION: For the best refilling experience, only use OEM original/genuine ink tanks or remanufactured OEM cartridges which have been cleaned, refilled and tested for proper performance (i.e. HP, Canon, Epson or Brother trademark logo should be readily visible on cartridge).